Oregano is a aromatic perennial herb in the mint family (Lamiaceae). Dried leaves of oregano are used to improve the flavor of salty dishes, usually made of vegetables and meat. Fresh flowers of oregano are also edible. It is characterized by opposite, aromatic leaves and purple flowers. Amount of aromatic oils and chemical composition of the plant depend on the habitat, climate and type of soil. Oregano was first used by the Greeks. In their mythology the goddess Aphrodite invented the spice. Giving it to man to make his life happier. Oregano is best known as "pizza herb". Other than that, oregano is used as basic ingredient for the preparation of famous Italian specialties such as pastas, spaghetti and tomato dishes. After the Romans conquered the Greek, the Romans inherited the use of oregano and the Romans were the ones responsible for the extensive use of oregano all over Europe and abroad. After that, with time this herb found itself a journey from the Middle East to China. Oregano became popular in the USA after the Second World War when American soldiers returned home from the battle fields in Italy. Besides bad war memories, they brought spice for pizza to their country. Name “oregano” originates from Greek language and it means “delight of the mountains”. Mexican oregano is special kind of oregano that is mainly used in western societies. This type of oregano is one of ingredients of the chili powder. Oregano was not widely used in the United States until after the Second World War. Soldiers discovered the herb during the Italian Campaign and brought it back to the United States. Oregano contains vitamin A, C and K and minerals such as iron and manganese. Oregano is usually grown as a small evergreen subshrub in mild climates. Oregano was initially used as medical plant before it became popular as spice. Aromatic oils and chemicals from oregano can relieve stomach ache and prevent bloating. They also alleviate respiratory difficulties. Oregano can be used against sea sickness. It also shows antimicrobial and antifungal properties, which means that it can be used against bacterial and fungal diseases. "Therapeutic" oregano can be consumed in the form of tea or ointment. Oregano is a perennial herb, growing from 20 to 80 cm (8 to 31.5 in) tall, with opposite leaves from 1 to 4 cm (0.4 to 1.6 in) long. The flowers are purple, 3 to 4 mm (0.12 to 0.16 in) long, produced in erect spikes. Ancient Greeks believed that cow’s meat becomes more tasteful when cows consume oregano as a regular part of their diet. Oregano can be propagated via seed or through division of the existing plant. Oregano is a culinary herb, used for the flavor of its leaves, which can be more flavorful when dried than fresh. It has an aromatic, warm, and slightly bitter taste, which can vary in intensity. The herb has long been an essential ingredient of Mediterranean cooking. Oregano blooms during the summer and autumn. Flowers are purple and located on the top of erected stalks. It serves as a culinary herb added to meat, soup, and sausages, among others, and is particularly popular in tomato-based dishes and pizza. Oregano is high in antioxidant activity, due to a high content of phenolic acids and flavonoids. Leaves are small, rounded and grayish-green in color. They are gathered in pairs that are oppositely arranged on the branches. Oregano is a powerfully antiseptic plant thanks largely to its constituents known as carvacrol and rosmarinic acid. 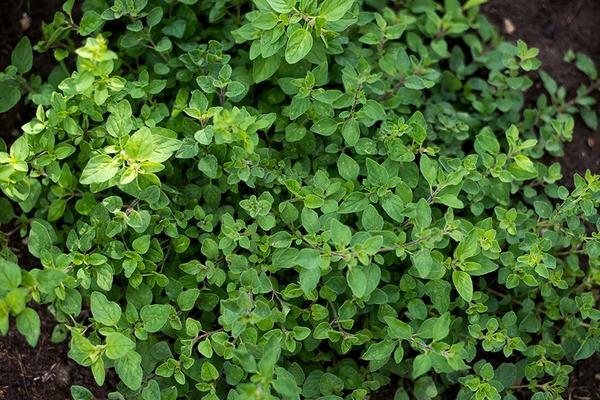 Unlike antibiotic drugs that work only on harmful bacteria, these compounds in oregano work against bacteria, viruses, fungi and even parasites like worms, making it a well-rounded antiseptic to keep in your natural medicine cabinet. Chemical compounds from oregano repel insects. Because of that, oregano may act as natural insecticide when it is planted in the garden. Other health benefits of oregano include ability to protect the immune system, prevent the onset of chronic diseases, improve digestion, detoxify the body, strengthen the bones, improve heart health, boost energy levels, protect against diabetes, calm nerves and even as cure for sea sickness. Oregano grows as shrub that can reach 29 inches in height. Oregano has been used medicinally since the time of the ancient Greeks. Oregano is perennial plant, which means that it lives more than two years in the wild. Hippocrates, one of the greatest philosophers from the times of the ancient Greek, has found uses for oregano as an antiseptic. Oregano oil can be used to keep of yeast infections and can be used for respiratory health and strengthening the immune system. A drop of oregano oil on toothbrush will help completely take care of gum disease and tooth decay.